When you think of Southwest Florida you think beaches, boating and basking in the sun, but the area has also become home to numerous breweries, and even a distillery. With the snowbirds gone and the dog days of summer upon on, what could be better than stopping into a cool local brewery or two for a tour or a taste, to help us forget about the heat and humidity for a while. 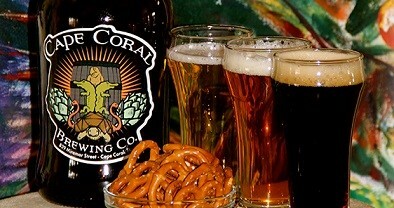 Cape Coral Brewing Company located at 839 Miramar Street in Cape Coral. Cleverly named brews such as Burrowing Owl Brown Ale, Yacht Club Cream Ale and Bad Buoy IPA clearly allude to the city they're crafted in. You can take a self-guided or guided tour or just stop by the Tap Room for samples of their fresh brews. Visit CapeCoralBrewing.com for hours of operation and more info. Love beer tasting? Or going out for a drink? Then, these Cape Coral breweries are just the spots for you. Cape Coral is full of places to go out and enjoy a night out. If you're thinking about making the move to Cape Coral or another town nearby in Southwest Florida, let Tom and I help you. Whether it's a waterfront home, or something more inland, we can help you find your dream home in Cape Coral, Fort Myers, Bonita Spring, Fort Myers Beach, or Naples. Click here to start your search or call us at 239-357-6118.